This information supports and supplements information included in the UNC-Chapel Hill Design Guidelines-specifically, Chapter V: Section 02475 A and Section 11170. Contact Shawn Ellis at 919-201-2832. Each building is to have an outdoor recycling collection site (cardboard dumpsters and recycling carts). The designer must, for projects in which this requirement cannot be met, specify what cannot be sited at the building and the recommended location that will serve as an alternate site for these services. This is to be submitted to the Office of Waste Reduction and Recycling and to Housekeeping Services for approval. Design considerations for waste and recycling containers must be based on the building’s usage and occupancy. All containers shall be located on an accessible path of travel per the ADA and State Building Code. A variety of programs can utilize the outdoor service areas. Along with this a variety of containers and vehicles are used to service the program. More information is given below. 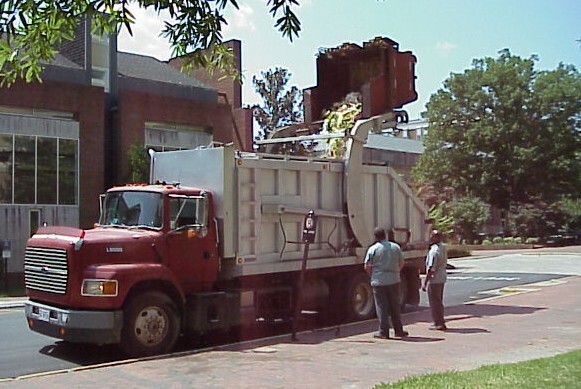 Dumpsters are serviced by front load trucks. The standard size for a cardboard dumpster is 8 cubic yards. 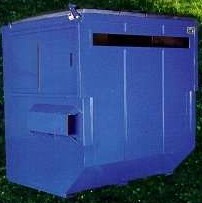 As of April 2006, the standard trash dumpster is 8 cubic yards with access via closable sliding side doors. 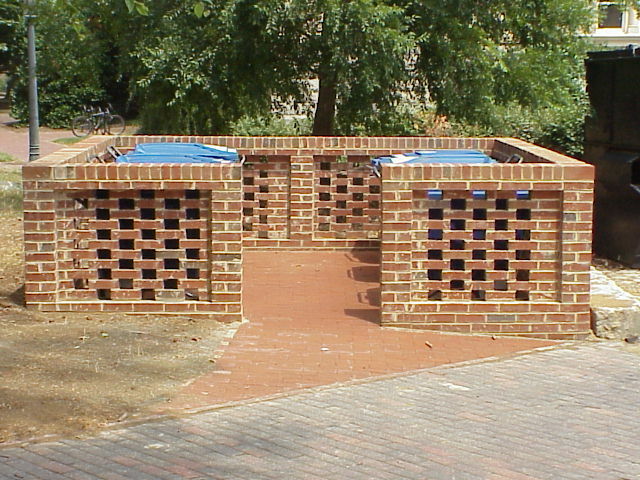 The concrete pad for the dumpsters can be designed in a variety of configurations as long as the pad and site meet the University’s service requirements. Pads should be sloped away from rear wall and towards planned drainage routes to avoid pooling around dumpsters and carts. 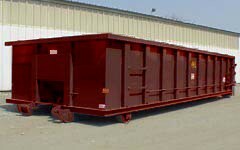 The quantity, size, and type of dumpsters needed is dependent on the building use and size. When volume or special needs dictate a larger dumpster, horizontal compactors are recommended. Contact the Office of Waste Reduction and Recycling for assistance determining the size and type of container needed. More information about the specific containers and their dimensions is listed on Waste Handling Containers and Equipment. The information in this section can be found in the UNC Design Guidelines, Chapter III. University Planning Standards, Section A. Site Design, 16. Outdoor Recycling and Solid Waste Collection Sites. A standard outdoor service area consists of 3-6 recycling carts, a cardboard recycling dumpster and at least one trash dumpster. Other situations may require more than one trash dumpster, additional outdoor recycling carts or containers for grease, food waste or animal bedding. Site dimensions and configurations should be adjusted accordingly and reviewed with OWRR for approval. 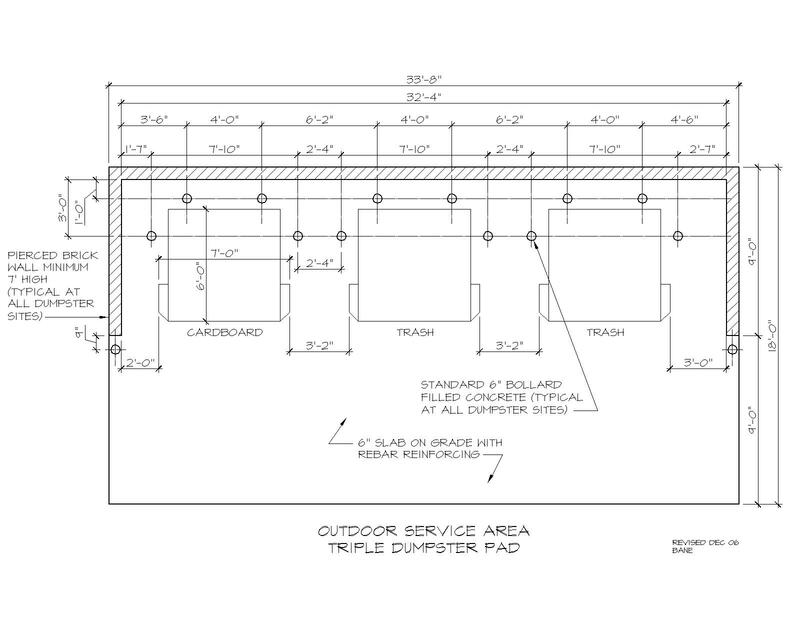 The pad for the standard outdoor service area must be at least 18′ deep and 27′ 11″ wide (Horizontally: 24’3″ for the dumpster section and 4′ for the recycling container section. Vertically: 8′ for the dumpster and 10′ for the truck.) Slope pad such that water does not pool around dumpsters or carts. Elevation drawings and details for outdoor service areas must be shown on the plans. 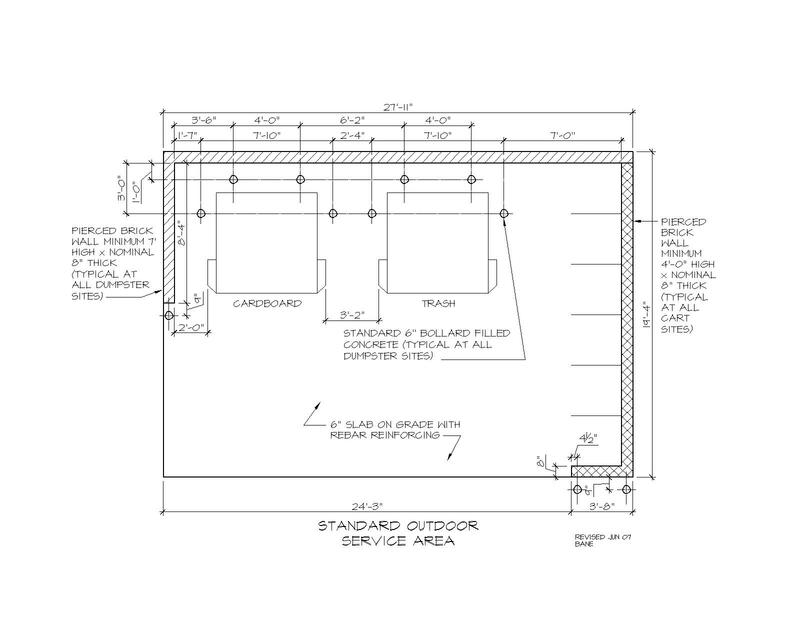 Click on the image for a sample drawing of a Standard Outdoor Service Area. coordinating with OWRR to make arrangements for any special needs or assistance with ordering equipment. Using enclosure walls, screen sites from public view with constructed elements and landscaping. An enclosure is required for all outdoor service areas unless exempted by OWRR. Consideration should be given to maintaining visibility for vehicular and pedestrian safety issues. The interior and exterior enclosure walls shall match the exterior architectural finishes of the adjacent building(s). 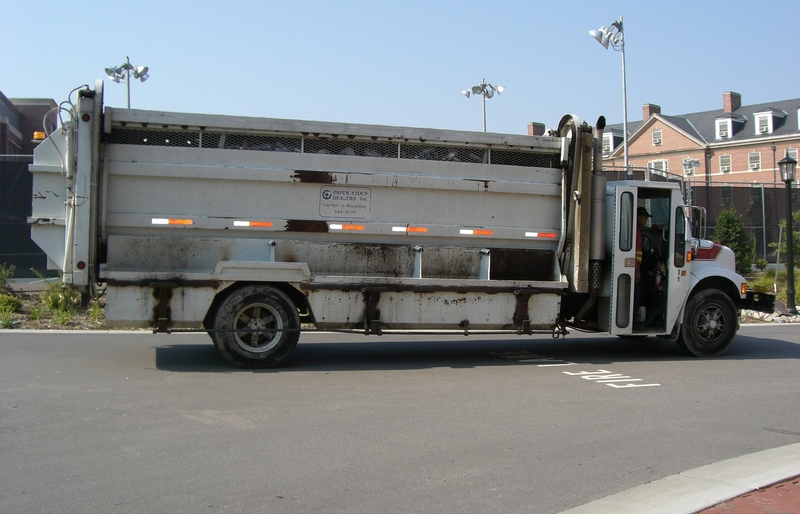 Use bollards at the wall entrances by the dumpsters to protect the walls from being hit by the service truck. Do not install any piping, equipment, utility vaults or access hatches inside the outdoor service area enclosure. All walls should meet current building codes. 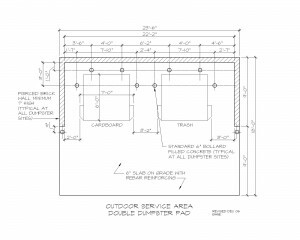 The sample drawings for outdoor service areas and dumpster pad only give the recommended wall height (7′ to screen dumpsters and 4′ to screen carts). 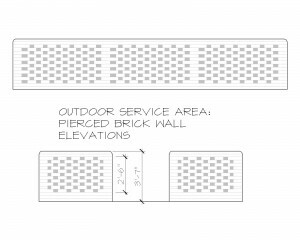 The Screen Wall page gives examples and information regarding brick walls that can be used to screen service areas. Gates must be safe and easy to operate (lightweight, no pinch points, one-person operation). Gates may be used to screen dumpsters from pedestrian and vehicle view, while allowing housekeepers and other users to see inside for safety purposes. Gated enclosures should have easy pedestrian access to sides of trash dumpsters and front and back of cardboard dumpsters. Enclosures should have a level entryway to allow for support at gate’s opening ends (for safety and maintenance). Gates shall close all the way and latch in the both the closed and opened positions. Gates and enclosures shall allow easy truck access (room for mirrors and for the gates to open more than 90 degrees). Gates shall have intermediate posts instead of large, bi-fold spans. Have catches for the rods that don’t have pinch points. Gates should conform to a campus aesthetic standard if possible (color, style) for consistency’s sake and ease of maintenance. Do not use the loading dock of a building for the dumpster location. The service area enclosure shall be located adjacent to the service drive and loading dock of the building. The Waste Handling Vehicles page gives dimensions for all OWRR service vehicles. Position the dumpster pad such that the truck can approach the containers head on. To do this, take into consideration the turning radius, truck length, and angle of the approach. The pad should be a minimum of 3,000 PSI concrete, with #4 bars at 12″ on center each way, and 6″ thick. Pour the pad on compacted earth with a minimum base of 4″ Chapel Hill gravel. These are minimum requirements. Final structural design of pad shall be based on project requirements. Bollards at dumpsters areas are to be 6″ in diameter and filled with concrete. These should be located 12″ from the center of the bollard to the rear of the pad (or screen wall). The bollards shall be 6′ 6″ in total length with at least 2′ set in reinforced concrete. Finish the bollards with one coat exterior metal primer, and two coats exterior yellow. 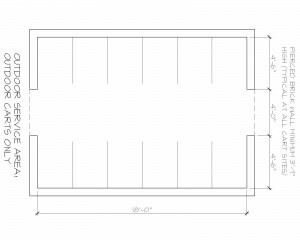 For bollard placement, see sample drawings. There MUST be a ramp at least 5′ wide for access to the recycling containers. Also see UNC-Chapel Hill Design Guidelines Chapter V: 02450 Walks – Steps and Ramp Construction. The floor of the enclosure (or the pad) shall slope 1/8″ per foot to allow rainwater and other liquids to drain off without pooling. Enclosure walls shall have weeps evenly spaced around the bottom edge to allow for drainage. These weeps and the grade of the floor shall direct to the run-off into landscaped areas rather than onto concrete sidewalks and driveways. Do not locate grease pit/traps for cafeterias inside the outdoor service area enclosure. If a grease pit/trap is necessary for the building, it shall have an enclosure separate from the outdoor service area enclosure. The two may share a common wall, but they shall have their own enclosure walls and separate entrances. Provide sufficient lighting for the security of the personnel and campus community using the site at night and during the early morning hours. Provide adequate illumination inside and outside the enclosure and on the normal routes to/from the adjacent building(s). Solar power and motion and daylight sensors may be used. The information in this section is supplemental to UNC Design Guidelines, Chapter V. Technical Design and Performance Standards, Section B. 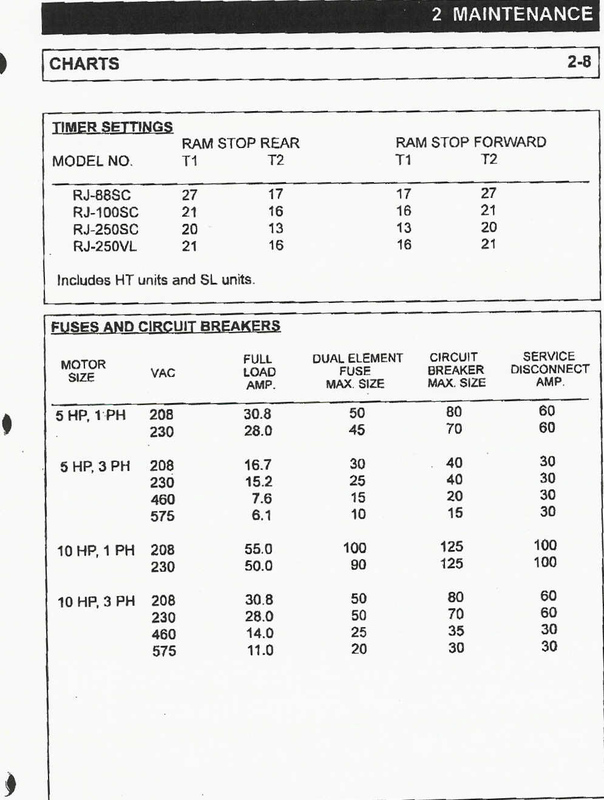 Division 2 – Site Work (Spec 02475) and Section K. Division 11 – Equipment (Spec 11170). Ideally the recycling carts and dumpsters will be on the same pad and enclosure. 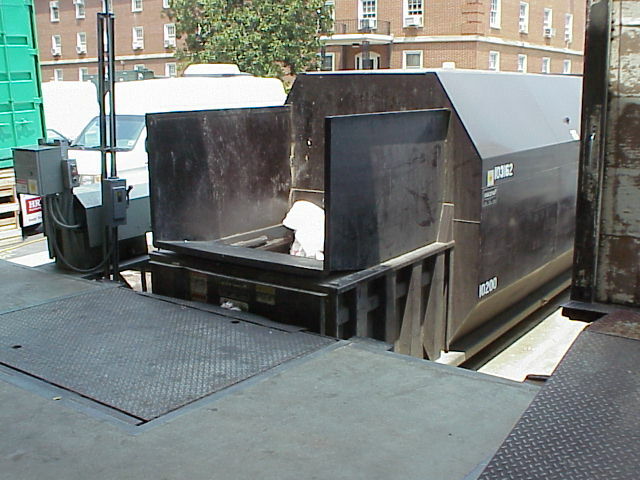 However, in some cases such as at residence halls, it is necessary for the dumpsters (or compactors) to be located on separate pads from the carts. Please see the trash dumpsters and cardboard dumpsters sections. 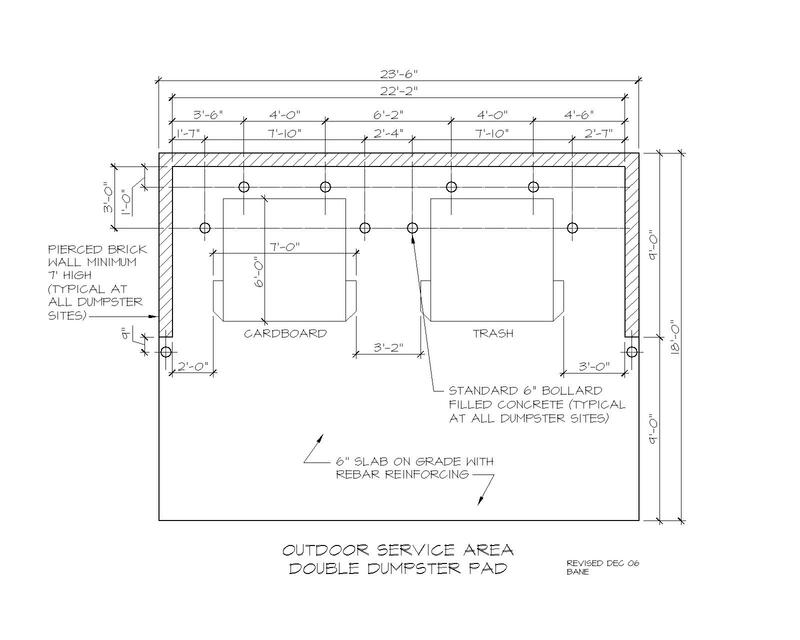 This section lists the details for a dumpster pad configured for two dumpsters, one for cardboard and one for trash. Site dimensions for additional dumpsters and configurations should be adjusted accordingly and reviewed with OWRR for approval. 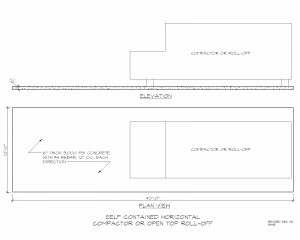 The pad for the standard outdoor service area must be at least 18′ deep and 20′ wide. This accommodates two dumpsters (trash and cardboard). Slope pad such that water does not pool around dumpsters or carts. 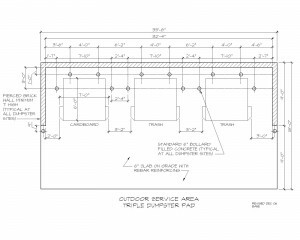 Elevation drawings and details for outdoor service areas must be shown on the plans. 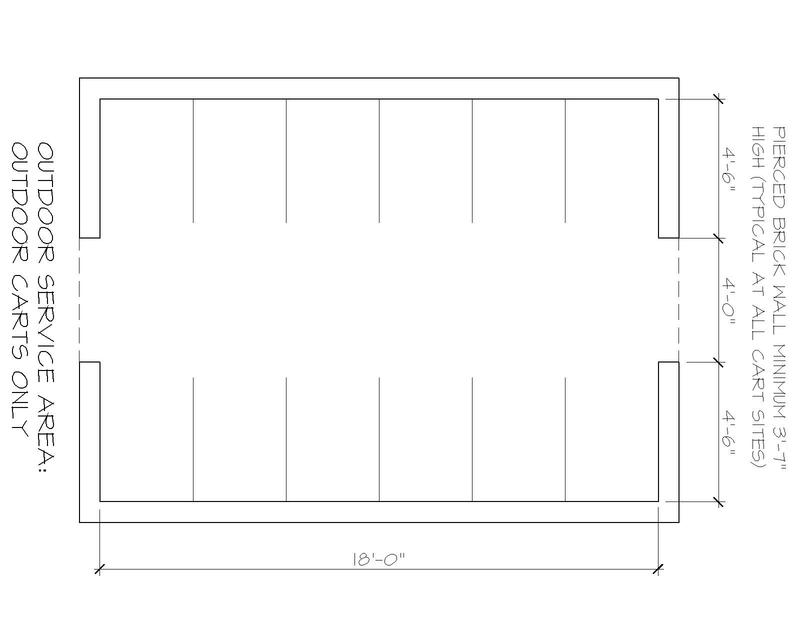 Click on the images for sample drawing pads for dumpsters only. Do not use the loading dock of a building for the dumpster location. The service area enclosure shall be located adjacent to the service drive and loading dock of the building. The Waste Handling Vehicles page gives dimensions for all OWRR service vehicles. Ideally the recycling carts and dumpsters will be on the same pad and enclosure. 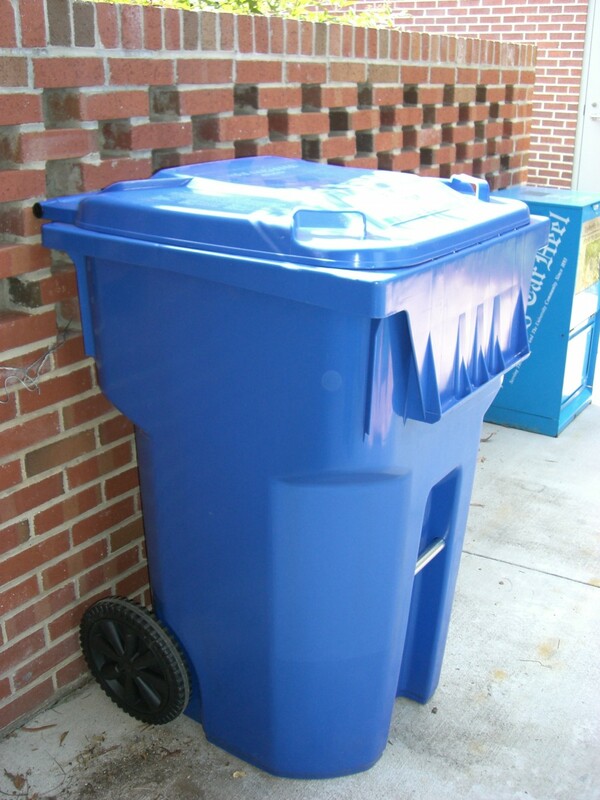 However, in some cases, such as at residence halls, it is necessary for the outdoor recycling carts to be located separate from the dumpsters. This section lists the details for a stand-alone recycling cart area that can accommodate 6 recycling carts. Dimensions for fewer or additional carts and configurations should be adjusted accordingly and reviewed with OWRR for approval. Residence halls require 7-9 carts, depending on the number of occupants. A pad and enclosure for outdoor carts that can accommodate 6 carts is given in 2 configurations. One measures 9’4″ by 11’4″ and has 3 carts parallel to one another. The other configuration has 6 carts in a line and measures 17’4″ by 8’4″. Click on the image for a sample drawing for Carts Only. Waste Handling Containers and Equipment-see the outdoor carts. OWRR supplies these bins. However, if a large number are needed for the project (more than 12), please notify OWRR 6-8 weeks before the project is finished to make sure that the bins will be available for the building opening. 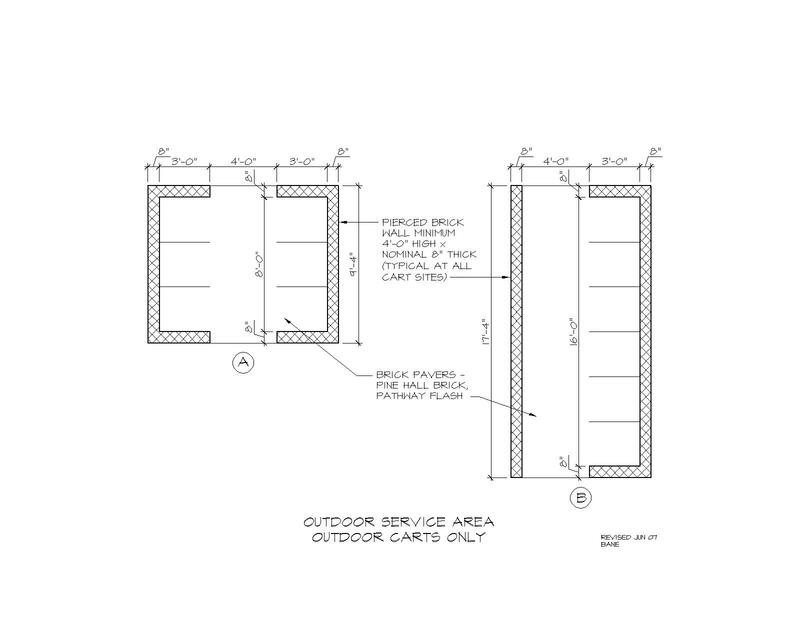 View the sample drawings for a carts-only outdoor service area. 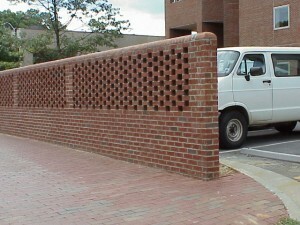 The Screen Wall page gives examples and information regarding brick walls that can be used to screen service areas. The service area enclosure shall be located adjacent to the service drive and loading dock of the building. The Waste Handling Vehicles page gives dimensions for all OWRR service vehicles. Ideally, the recycling carts and trash and cardboard dumpsters will be on the same pad and enclosure. 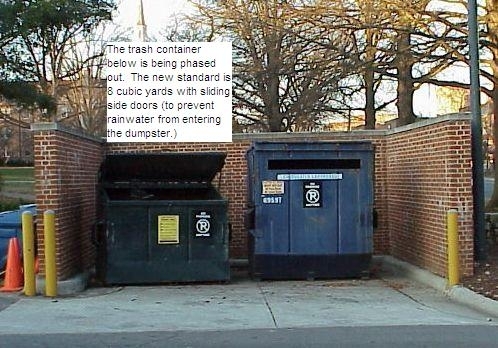 However, the quantity, size, and type of dumpsters needed is dependent on the building use and size. When volume or special needs dictate a larger dumpster, horizontal compactors are recommended. These may be used for trash or cardboard. When there is adequate volume of both trash and cardboard but very limited space, a split body compactor may be considered. Do not use horizontal compactors at residence halls without written approval of OWRR and Housing and Residential Education. 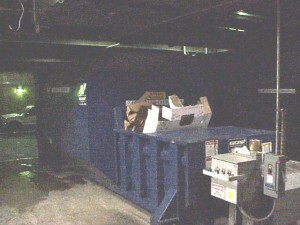 Many locations requiring compactors also require containers for grease, food waste or animal bedding. Site dimensions and configurations should be adjusted accordingly. Contact the Office of Waste Reduction and Recycling for assistance determining the size and type of container needed. 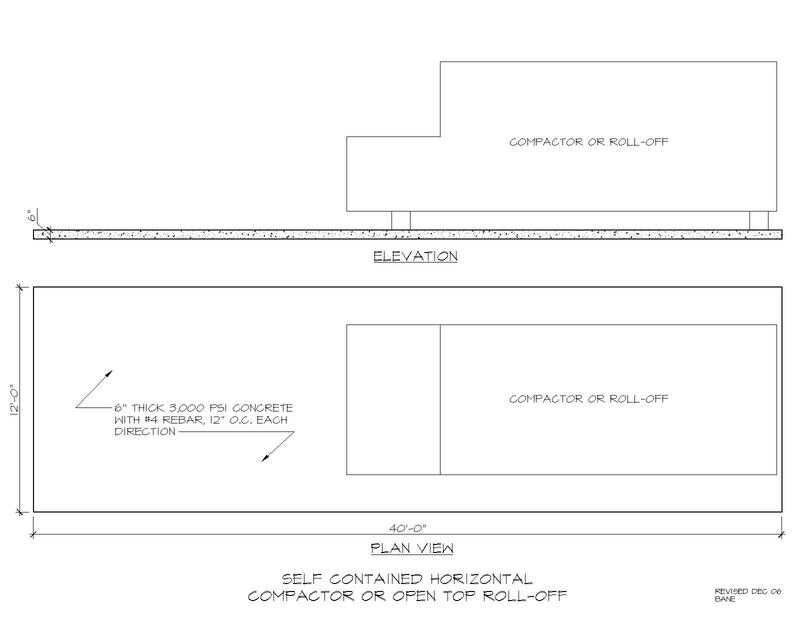 The pad for a 30-cubic-yard horizontal compactor should be 12′ wide and 40′ long. 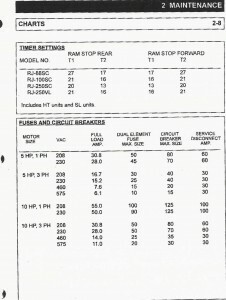 Additional space may be needed for the electrical unit. 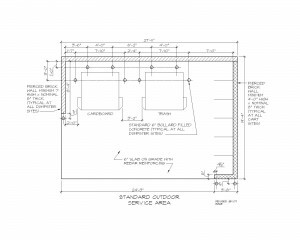 Elevation drawings and details for outdoor service areas must be shown on the plans. 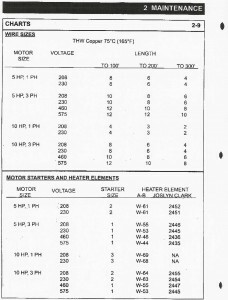 Click on the image for a sample drawing of a pad for a Horizontal Compactor. 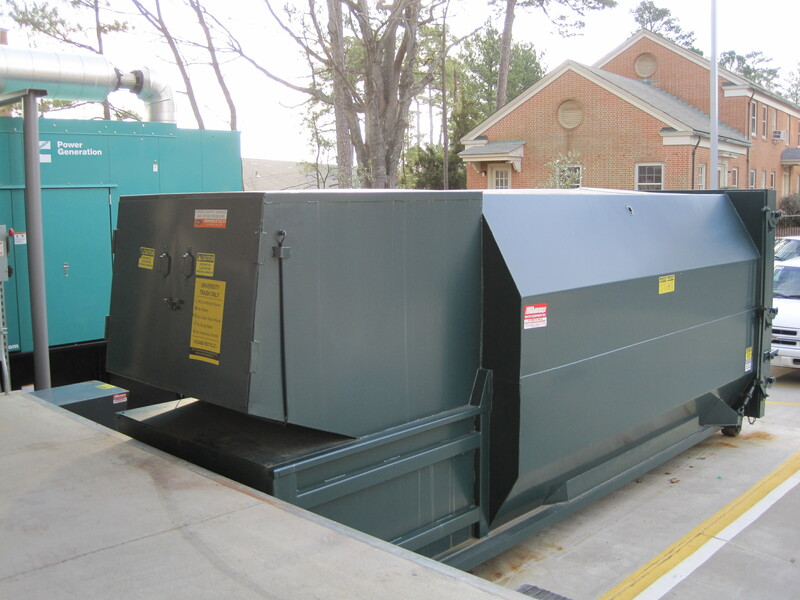 We consider compactors part of the building and require that the design team spec the equipment into the project. This information should be included in Section 11170 Solid Waste and Recycling Handling Equipment. We recommend that the design team work with an equipment supplier early in the design process. Always try to use the largest container possible for the space, thereby minimizing the number of times the container has to be pulled to the landfill or recycling facility. Consideration should be given to maintaining visibility for traffic and safety issues. Gates are not to be used for reasons of safety, maintenance, and operational issues. 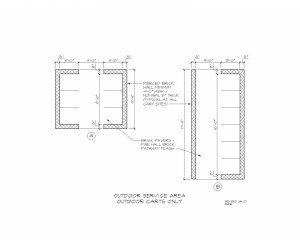 The sample drawings for outdoor service areas and dumpster pad only give the recommended wall height (7′ minimum). 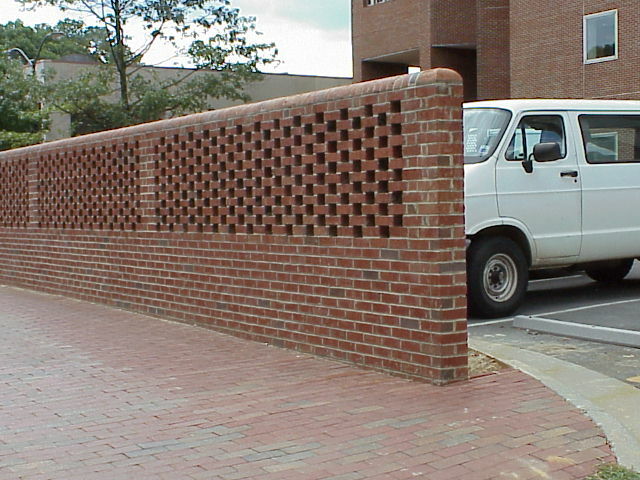 The Screen Wall page gives examples and information regarding brick walls that can be used to screen service areas. In almost all situations, the compactor should be located on ground level adjacent to the dock (see photo right). Doghouses and feeder chutes may be needed to feed materials into the compactor. Check with OWRR and an equipment supplier for guidance on this. 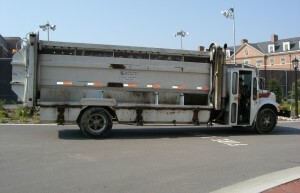 The Waste Handling Vehicles page gives dimensions for all OWRR service vehicles. Position the pad such that the truck can back straight up to the compactor. To do this, take into consideration the turning radius, truck length, and angle of the approach. Issues related to placing compactors ON the loading dock include the height of the dock and the placement of the control box. The truck may not be able to service containers placed on docks higher than 42″. Also, a wench may be necessary to pull the rest of the way onto the dock. The control box will be surface mounted. 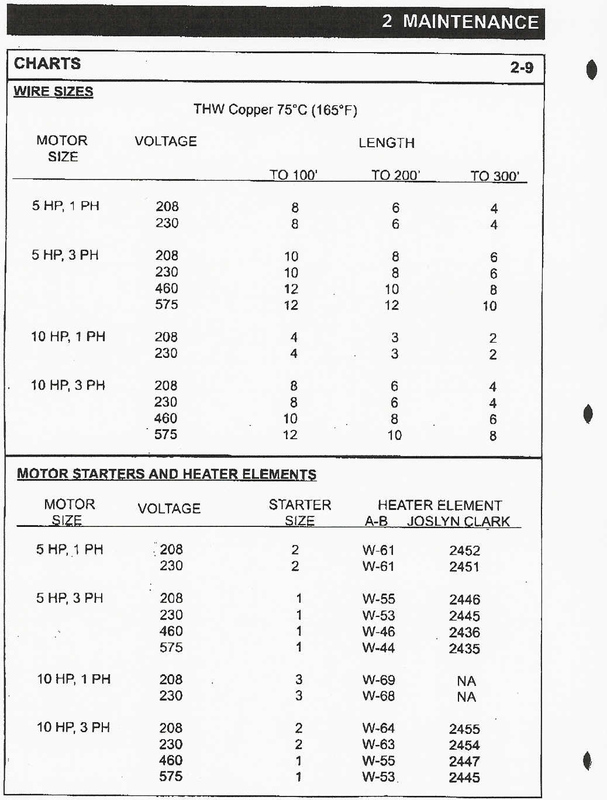 The disconnect box must be located near the control box and should be wired for a 10 HP 3 phase motor with 480 V.
Electrical detailed information (from Marathon Equipment Co.). Click on images for full page views. Install operation switch sufficiently far from compactor to maintain safe operation. Do not place where broom handles or other devices can be used to “lock” the switch in the operating position. In the event of a failure in the compactor seal or other malfunction, the site must be sloped for drainage into a drain located out from under the container. Drain size should be consistent with UNC standards. Pipe drain into sanitary sewer system and provide an oil water separator system. Provide an anti-freeze hydrant for wash down purposes at all sites using compactors. The floor of the enclosure (or the pad) shall slope 1/8″ per foot to allow rainwater and other liquids to drain off without puddling. Enclosure walls shall have weeps evenly spaced around the bottom edge to allow for drainage. These weeps and the grade of the floor shall direct to the run-off into landscaped areas rather than onto concrete sidewalks and driveways. 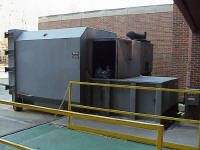 Theatres, art studios, and maintenance shops often produce bulky waste that cannot be collected in front load dumpsters. Open top roll-off containers must be sited in some instances. Examples of buildings that generate bulky waste such as construction debris, pallets, scrap metal, etc. on a regular basis may include theatres (set striking debris) and maintenance shops (Athletics, Facilities Services, Cogeneration, etc.). Other areas utilize rolloff containers seasonally or temporarily for special events such as festivals, sporting events or student move-in and move-out. Site dimensions and configurations should be adjusted accordingly. Contact the Office of Waste Reduction and Recycling for assistance determining the size and type of container needed. The pad size will be dependent upon the container selected. Always try to use the largest container possible for the space, while still allowing easy loading of materials by workers. 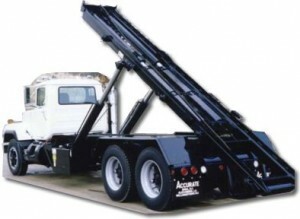 For a 20-40 cubic yard rolloff container, the pad should be 12′ wide and 40′ long. 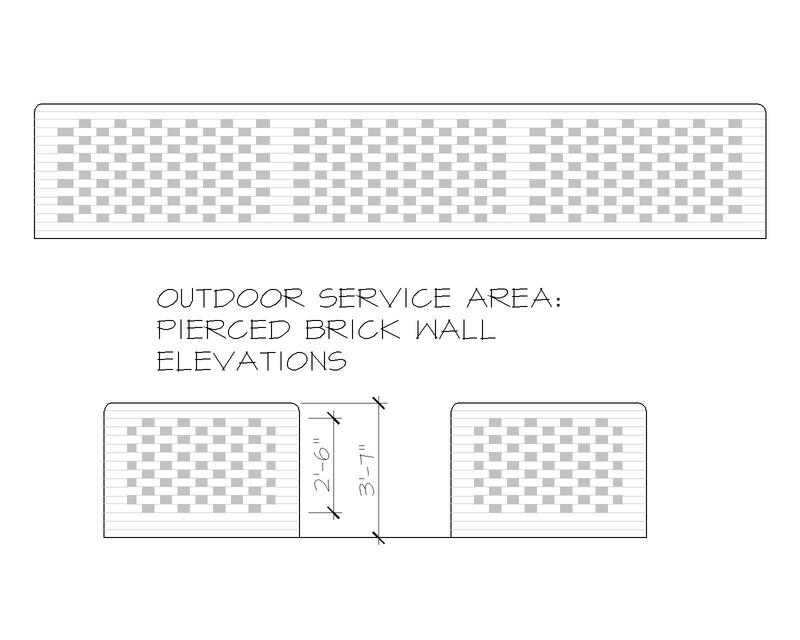 Elevation drawings and details for outdoor service areas must be shown on the plans. Click on the image for a sample drawing of a pad for a Rolloff Container. 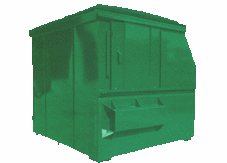 The Waste Handling Containers and Equipment page provides detailed equipment information. Position the dumpster pad such that the truck can back straight up to the compactor. To do this, take into consideration the turning radius, truck length, and angle of the approach. Animal labs and quarters require exterior space for the collection of animal bedding. These materials are collected by the animal lab staff and stored outside for pickup. The Office of Waste Reduction and Recycling and the Department of Laboratory and Animal Medicine (DLAM) Manager can provide guidance on the space and service needs for this. Click on the image for a sample drawing of Carts Only. In situations with extremely high volumes, specialized equipment will be utilized (thus, the equipment listed here will not apply). 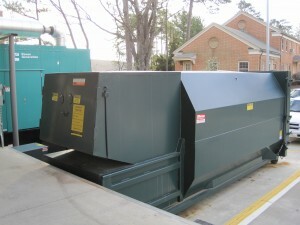 For example, a high volume building may opt to use a horizontal compactor and vacuum system instead of carts. Please consult OWRR and the DLAM manager for guidance on this. The floor of the enclosure (or the pad) shall slope 1/8″ per foot to allow rainwater and other liquids to drain off without pooling. When the building contains food service operations, containers and exterior space must be allocated for food waste recycling and grease collection. Check with Auxiliary Services/Campus Dining Services for requirements for grease recycling (required by state law). Food waste recycling space needs can be determined by the Office of Waste Reduction and Recycling. 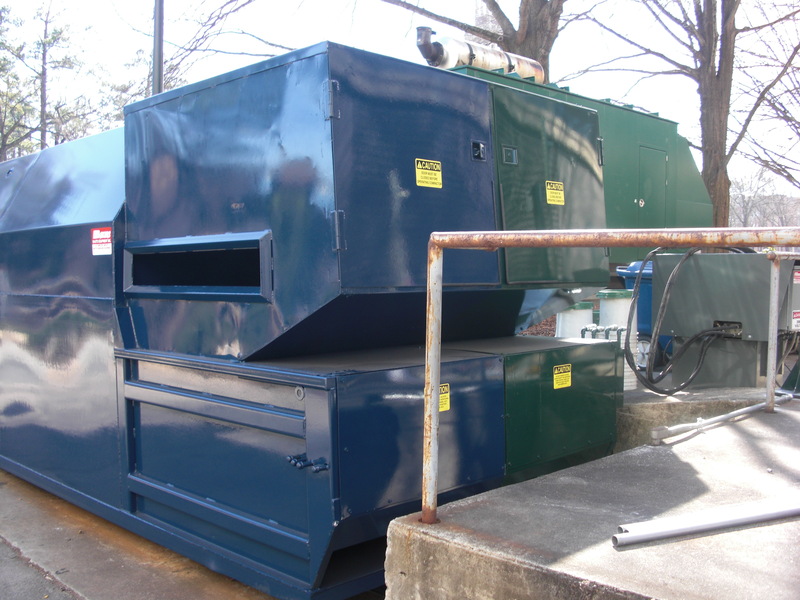 The Waste Handling Containers and Equipment page provides detailed information on all of the equipment used at our outdoor service areas, including dimensions, requirements, etc. The contractor supplies these bins. However, please notify OWRR 6-8 weeks before the project is finished to make sure that the bins will be available for the building opening. In situations with extremely high volumes, specialized equipment will be utilized (thus, the equipment listed here may or may not apply). For example, a high volume building may opt to use pulpers to reduce volume. ability to wheel carts to the truck from the recycling site. When the building contains food service operations, containers and exterior space must be allocated for grease collection and food waste recycling. Check with Auxiliary Services/Campus Dining Services for requirements for grease recycling (required by state law). The North Carolina Division of Environmental Quality provides information regarding fats, oils and grease (FOG) management in North Carolina. The food vendor (Campus Dining Services, Doubletree, etc.) is responsible for managing the contract for this service. 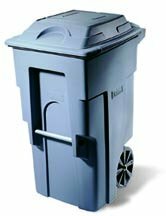 The Waste Handling Containers and Equipment page provides detailed information on all of the equipment used at our outdoor service areas, including dimensions, requirements, etc. The grease collection contractor supplies these containers. Note: Grease collection containers with a capacity of 55 gallons or more may require a spill protection plan. Consult with the UNC Department of Environment, Health and Safety for more details.